Filmmaker Michael Bay finally did right by the ‘Transformers’ movie series regarding his monotonous, massive mechanical misfits. Instead of helming another insipid instalment after directing the previous six clash-and-clang clunkers he had sense enough to step behind the scenes with a producing credit. This time around Travis Knight (Kubo And The Two Strings’) calls the shot for the latest and perhaps greatest ‘Transformers’ edition yet in the surprisingly received teen angst-driven actioner ‘Bumblebee’. Undoubtedly energetic, infectiously witty, and resourcefully feisty, ‘Bumblebee’ manages to legitimately boost this film franchise beyond the tiresome titanic tin-induced boisterousness it had been known for previously. Granted it appears that ‘Bumblebee’ is the unconventional type of ‘Transformers’ offering. For starters, the skilful visual effects do not compromise the simple and solid storytelling methods regarding the head-scratching bond between a somewhat detached young girl during her coming-of-age period and her trusty robotic companion. 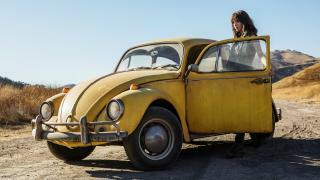 ‘Bumblebee’ is frenzied family fun entertainment with a notable message about belonging and feeling connected. The machismo flexing done in the ‘Transformers’ flicks are all well and good but ‘Bumblebee’ manages to scrape away all the raucous rust and dust and dares to have a semblance of heart, cheekiness, and female/human empowerment among the battling gigantic gizmos. Screenwriter Christina Hodson’s (‘Unforgettable’) script has a follow-the-dots discipline in terms of its formulaic groundwork. Still, she manages to instil some tender leanings for her young feminine protagonist while ensuring that the adequate dosage of machinery mayhem is maintained for its fanboy base. The ’80s-set ‘Bumblebee’ may be considered a prequel to the ‘Transformers’ movie universe but its distinction from the other films is its heralded selling point. ‘Bumblebee’ lead Hailee Steinfeld, the young Oscar-nominated actress from ‘True Grit’, plays Charlie whose 18th birthday is approaching in 1987, yet she seems lost about what the future holds for her. Otherwise, Charlie is the typical teen trying to exist in her small California town surroundings. She is an avid music lover and loves tinkering with cars. In truth, Charlie wants her own car and if it means trying to patch up her late father’s vintage vehicle then so be it. Poor Charlie is still trying to get over the sadness of losing her father to death yet craving some transportation as a form of independence. Well, the teen unexpectedly gets both wishes when she stumbles upon a yellow VW Beetle at the local junkyard lot. She takes the motorised specimen home only to find out that her new wheels transforms into a hulking, shaken giant robot. Charlie cleverly calls the mysterious yellow mechanical monster Bumblebee (voiced by Dylan O’Brien). Eventually, the duo would forge a caring special bond that is utterly indescribable. As for Bumblebee’s backstory, he is a Transformer sent to Earth by the Autobot resistance in order to protect the earthlings from the rival Decepticons out to destroy the planet. There is a vicious war between the Autobots and Decepticons back where they hail. Bumblebee’s mission to secure Earth from the dastardly Decepticons will be a challenge to say the least. Much like Bumblebee, the Decepticons arrive and disguise themselves as automobiles to not be detected. Thus, Bumblebee needs to safeguard himself from not only a destructive Decepticon but from the military forces represented by Agent Burns (John Cena, ‘Blockers’). 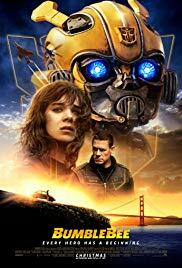 Since it feels like a lost cause at home dealing with her mother and stepfather (Pamela Adlon and Stephen Schneider), Charlie has found renewed enthusiasm in joining Bumblebee on his critical crusade to rescue mankind from the renegade robots looking to create major havoc. From cleaning up Bumblebee and adjusting his fixtures to standing on the frontlines and facing possible disaster Charlie is uniquely motivated in brandishing her concept of constructive girl power. Thankfully, she has found a sense of purpose and pride and oddly…a kind of special love and affection from Bumblebee that a fellow human cannot offer her at this point. ‘Transformers’ fanatics will still have their share of bombastic thrills to dazzle the eyeballs and get the adrenaline flowing. The feuding bots do not disappoint and the ’80s-era actioner nostalgically brings back the reminiscent rock ’em and sock ’em vibe where the ‘Transformers’ cartoon phenomenon developed. Importantly, Knight ensures that the huge and ever so mighty yellow bot is in reality a creaking creature dripping with vulnerability. As with other 1980’s movie aliens sent to be embraced by the non-judgmental hearts of youngsters (calling E.T. anyone?) ‘Bumblebee’ is in that cinematic tradition. The film’s pounce-and-pathos mantra is refreshingly poignant and invigorating. Steinfeld’s Charlie is efficiently fleshed out as the young girl-turned-young woman out to define who she is emotionally and mentally. There is never any signs of cliched angsty dramatics as Steinfeld is astute enough to play her character as quietly disillusioned. The tomboy and her tremendous tin-can buddy is the genuine pulse behind this unlikely frenetic coming-of-age caper. The supporting cast assist in the giddy goings-on in ‘Bumblebee’ that help this SF action-adventure come into its own. Jorge Lendeberg, Jr. effectively portrays the geeky love interest of Steinfeld’s Charlie. Wrestler-turned-actor John Cena puts his action-packed antics and comical turn to good usage as the determined detractor out to bust Bumblebee’s endangered tail. It’s too bad that it took an unassuming ‘Transporters’ prequel to make this continued robotic romp palatable. Now if only Bumblebee could spread his good-natured wings in future inevitable ‘Transformers’ sequels then let the frolicking games begin! The Changeover (a film review by Frank Ochieng). « A Lot Like Christmas by Connie Willis (book review).